Did 50 miles mixed driving in sport mode in the 140 at the weekend and was surprised to see a return of 33mpg. I've noticed with my m235i that when it is cold the economy is very poor and I'm lucky to see high 20's for the first few miles when trying to be eco, however after it warms up there is a very noticeable increase in economy and the average readout for a 5-8 mile journey can shoot into mid 30's. When reset once warm it can exceed 40mpg in normal Comfort/Sport/Sport+ driving using manual mode. On the motorway at averages around 60mph the economy is 50-55mpg. Also when driving an 18 mile route with no other traffic I can achieve 45-50mpg in eco pro (coasting a fair bit) on normal country lanes/town roads. A truly remarkable car that makes me wonder if diesel has had its day. Sure when cold the petrol is awful, but so are diesels and they take longer to warm up. 50mpg when trying to be economical on the motorway is pretty good! I've noticed that on a steady flat road on cruise control in a fixed gear (using the manual mode) there is no difference between live-mpg when switching between comfort/sport modes. It seems to be only the throttle sensitivity and the use of lower gears in full auto mode that worsens mpg in the sport modes. Because of this I often drive in Sport+ mode using the manual gearbox via the paddles and regularly achieve mid 30's when the temptation to overtake everything on the road doesn't overcome me . It is possible to use lower RPM by using higher gears in manual mode Sport+ than the full auto mode will in Comfort mode. On a flat road there is no benefit to running in 5/6th gear at 30mph when 7 is quite capable. The car will even take 8th at 30mph on light throttle once it's warm! I don't recommend that though. Just my observations, I'm probably still running it in at 3,800 miles . For balance, when driving enthusiastically the mpg can drop into the high-teens but with natural traffic environments (traffic lights, other cars, Honda Jazz's all over the road, it soon ends up back into the mid-high 20's). This is a motorway journey which started from cold in a city and spent 23 miles on a motorway. This is a journey form town to town in the countryside, country roads, slight hills and towns, roundabouts, etc...eco pro mode with some coasting. 52MPG +/- 1MPG brim to brim over 6 tanks now. ~550Miles range. 70% A-Road/MWay 30% Stop/Start City. Any run over 10 miles typically gets 55-65mpg in summer unless there's terrible traffic. OBC is 1MPG optimistic which is good in my opinion. Remap added ~2MPG i'd say, as i'm getting the same figures in cooler temperatures. Eco-pro is completely useless and just makes me frustrated due the massive amount of pedal input required for no discernible MPG difference. I've only done 300 miles so far in my M140i (running in). The OBC tells me I'm getting 32mpg average, but I filled up yesterday and worked it out - I'm actually getting 27mpg. Not sure why the computer is so far out, it was quite accurate on my F30 - I'll keep an eye on it to see if it improves over time but if not I presume it will be adjustable in a hidden menu somewhere. Do any of you work out your MPG, or just take the OBC figure? 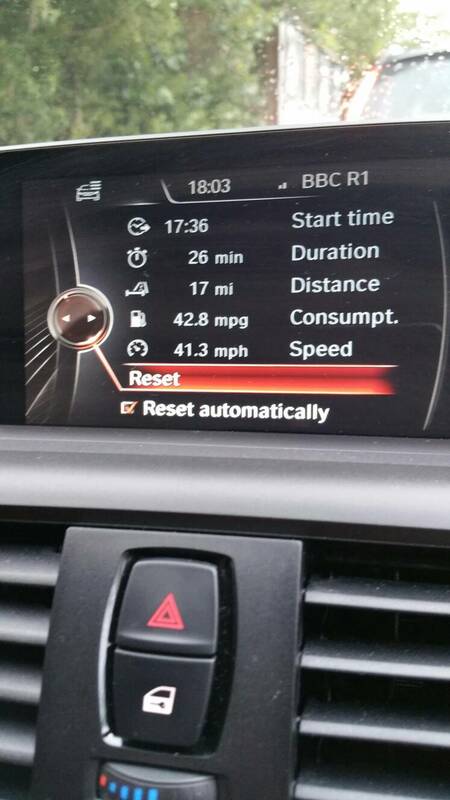 But 80% M62 (in 5th gear, not 6th, personal preference) + 20% Town driving over 71 miles. Manual box 116D ED Plus '16. Out of interest why would you use 5th gear for motorway speeds rather than 6th? Why would you want it to rev higher when 6th would alrrsdy be high enough at 1500/2000rpm? My trip computer shows an avg of 28 after 1,600 miles with a complete mixture of journeys. Some have been 17 and some have been 40+. The "live" mpg readout shows a steady 40 at 80mph in 8th on a flat, erm, private road, which I think is pretty impressive from such a big engine. My F21 116i wasn't much better on fuel than my 140i so far. I was getting 37 mpg out of my 123d. Which i never thought was very good. I also only averaged 37 out of my 123d. My m135 is almost as good, same price to tax and less to insure!